I think the second one really could be a chrysanthemum, it looks a lot like one. The first one I'm not so sure about. I first thought of Chinese bellflower, but neither the flower with six petals nor the leaves seem to match it. could the first one be a stylized lily? 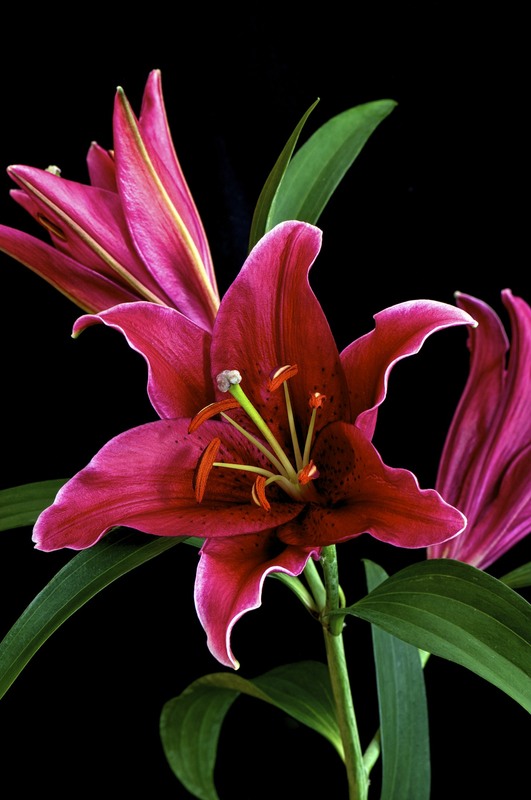 Tsubame wrote: could the first one be a stylized lily? Also, I know the advice for motifs is that early is ok but how early are we talking? Could I wear a summer motif in March? How about ume in December? Could I extend the chrysanthemum one into December since the background looks like snow? To me the flowers on the first obi look like lilies as well, but the leaves do not match, they are too long. With lilies the leaves are attached to the stem. Here it looks like the leaves are coming from the ground as it does with narcissus. And the flowerbud looks more like that of a narcissus, too. The chrysanthemum could be worn until end of November, but that is my opinion. Edit: After thinking it over, they look like tulips. There are variations with pointed petals. I'm voting for lilly and mum (the spider variety) as well. I am going to agree with utsusemi. The first one is not lily because of the leaves and how they are attached. I would also guess the flower could be either tulip or narcissus, so spring obi in either way. The second one is kiku in my opinion. Looks like I need to go on the hunt for a casual winter or all season obi! Star-of-Bethlehem has multiple flowers/buds on one stem and 6 petals though. My first thought was Day Lily (Hemerocallis) but it has the multiple flower thing too and the petal count is wrong (should be 6). The petal count on the flower here is 7, which does not fit Liliaceae which tend to have 6 petals or failing that, a number divisible by three. The issue is the same with many Amaryllidaceae as well. So it fails to be accurate for any Tulipa or Narcissus as well. It certainly has a distinctly Tulip/Day Lily/Narcissus kind of habitus going on but my final guess would be "whoever painted this was not paying very close attention to their reference" and by extension, "imaginary flower". Its seasonality would be spring or summer since it resembles spring and/or summer plants.